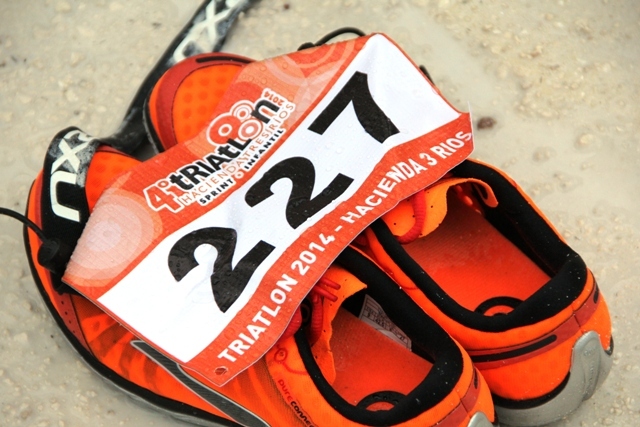 More than 400 athletes participated in the 4th Annual Hacienda Tres Rios Sprint Triathlon on May 18, 2014. Although at times it was pouring down rain, triathletes completed 750 meters swimming, 20 kilometers bicycling and 5 kilometers running. For the first time this year, a special children’s category was added for ages of 6 to 15 years old, in addition to the traditional sprint category for youths ages 16 and up. The overall winner in the mens’ división was Víctor Arroyo. Second place went to Luis Alberto Aguilar and third to Adrián Lizama. In the female division, Victoria Juanicotena placed first, while second and third place went to Isabella Luckie and Brenda Iñigo, respectively. Standout competitors included blind triathlete Marcos Velazquez and Ruben Grande, whose right leg is amputated from the knee down. To celebrate the accomplishment of all competitors, after the race athletes and guests attended the “Celebrate the Challenge” party which featured music, food, drinks and surprises. Despite the rain, all of the athletes, from the youngest to the oldest, gave it their all and the overall mood of the event went from determined (before) to celebratory (after). Sunset World and Hacienda Tres Rios are inspired by all of the triathletes and are honored to have hosted this annual sporting event.